A Visitor from WAY Up North! We have a friend at our house for about 6 weeks. He's hired help - FINALLY!! The kids named him Carson Crash or Car Crash for short. Nicci thinks he looks like our cousin Carson (he does), but Ethan wanted to call him Crash Bandicoot. We compromised. And Ethan has fallen for it hook, line, and stinker. He talks to Car Crash, waves to him, and writes him notes (has his sister write them for him). One morning Car Crash hadn't moved to a new spot. Ethan was very upset. He said, "Mom! He lost his powers because you touched him yesterday!" I had to read online to see how to get his powers back ;). What I discovered was that if Ethan does three nice things for someone else then the elf would get his powers back - piece of cake! So, he got busy making a bowl of cereal for Avery, then feeding Jasmine, and making our bed. Just like that Car Crash had hopped to a new spot! Why hadn't we thought of this earlier? I've got these friends. Let me just tell you how KRAZY they are . . . FIRST of all they have 8 kids. Yes, I said 8. 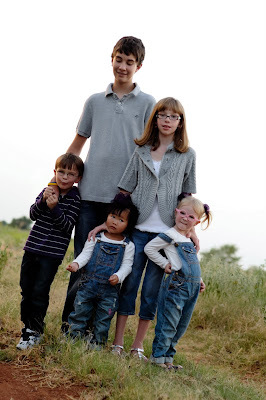 SECOND of all they are bringing home their NINTH child in a few months (it will be their SIXTH adoption from China). THIRD of all their kids' names all start with the letter "K" and each name is six letters long - kooky, I know. FOURTH of all they are one of the biggest examples in MY life of someone who has AMAZING faith. They KNOW that God is going to provide for their family, for their adoptions. They just know it. Adoption is not cheap, but God always ALWAYS provides. Kurrently they are fundraising for their newest treasure from China, Miss Kasidi (isn't that cute?). If you wouldn't mind taking a peek at their blog just to check them out I would just LOVE that. They make and sell the most amazing kandles - great for teacher's gifts or just to make your house smell yummy. You will be blessed! My "bloggy" friend Stefanie is having 30 days of give-aways!! WOO HOO!! Go check her out! But, don't do think link thing because the more people who do the link thing the less of a chance I get to win anything. Wait . . . is that selfish? Nevermind then, do what you want. Tomorrow is Orphan Sunday. We are an advocate whether we want to be or not (we want to shout it from the mountain tops, but what will Avery want? what will our other children want?) For now, we will be as vocal as we can. When Avery is older and more able to make decisions we will include her in how much she wants to be involved if at all. Like I said, we are a walking poster family for adoption even if we don't want to be. My basic message is for everyone to do something. There are MILLIONS of children who are orphans - they go to bed without being read to, prayed with, alone, they may or may not have access to the basic needs of food, clean clothes, regular bathing, medical care, nurturing, warmth, toys, they don't know what it means to have a mom or a dad, brothers, sisters, an extended family who dotes on them and loves them. Can you imagine what that must be like? If every Christian would adopt just one orphan there would be no more orphans. We are called to care for the orphans, it's Biblical. What does it mean to 'care' for an orphan? It can mean lots of things. Adopt. Pray for them. 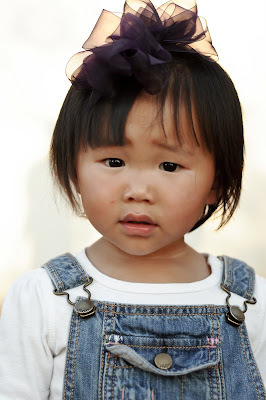 Provide financial assistance to organizations that help orphans like Half the Sky and Love Without Boundaries both help children in China by providing medical assistance or training for nannies and a lot more. Or you can search for blogs of people who are adopting. Families are always raising money to help with their adoptions. Some of my favorites are: k6comehome.blogspot.com www.redthreadstitches.com or orphaned-no-more.blogspot.com or www.wildolivetees.com or www.showhope.org. God knows every hair on their head, He is concerned with each one of them. I've been waiting to post about Huk*u (pronounced who-ko) Papers until I had some time to give it. I hope I do it justice because it just dumb-founded me that a system like this still exists. And from the research I have gathered it has only been around since the 1950s. It is Ch*na's way of classifying people into mostly two categories: urban and rural. It is associated with your family history and surname, and it follows you where ever you go. It sounds to me like it's a bit like illegal immigrants in your own country who can't go from province to province. Imagine living in Oklahoma and not being able to go to Texas for work. From what I gather this is what Huk*o papers do - keep track of or control their citizens (the article I read compared it to apartheid in South Africa). If anyone who reads this knows more about this subject than I do, then please chime in! Occasionally they will perform raids and round up anyone who is working outside their province and deport them. Well, what if you are an orphan in Ch*na? You have no home, therefore you are not tied to a family, or even classified as urban or rural. Forever you are classified as an orphan! Your Huk*o Papers tie you to your orphanage. You have an almost impossible time getting into college and getting a job (you are considered unlucky and people won't hire you). Amy Eldridge from L*ve With*ut B*undaries was our guest speaker at Ch*na Camp this past summer and she told us this (see the link here: chinaadoptiontalk.blogspot.com/search?q=love+without+boundaries, I hope you will read it). My heart was broken for these kids who have this stamp of disapproval for life in their country. So, in honor of Orphan Sunday, let's recognize that their is so much we can do to get this number down and bring home one more. The Butterfly Palace was one of the highlights of our trip to Branson. It was perfect for the little kids (and that one big kid we brought - the best big sister ever - NICCI!) There were all kinds of butterflies and lady bugs every where. They thought that the little girls' hair bows were flowers and would land right on their heads! They passed out pith helmets and magnifying glasses so they could really get into it. How many legs does a butterfly have? Such silly kids . . .
We took the scenic route on the way there. Not sure there's much of a choice, but it was beautiful to see the Mark Twain National Forest with all it's changing tree colors and winding roads swirling up into the mountains. When I was a kid we used to go to the Rocky Mountains in the summer. My Dad loves the mountains, but doesn't like driving up into them on rural roads much. We'd get up about half way and he'd precariously turn us around. These roads weren't like that. This was God's country. Our first day was spent at Silver Dollar City or Sinner Donner Cinny as Carlie called it. It was a beautiful day and we went all over that place more than once. There were only a few rides that Avery was tall enough to ride and she seemed fine with that. We kept her busy with the food and the sights. This was fun! It went up and down and round and round. I made Nicci go with me, she wasn't too sure about it and I don't think she was too happy with me. She's more of a roller coaster type of chick! We're missing one! Yup, Conner stayed back in Oklahoma with some friends so he wouldn't miss the church Fall Retreat. We really missed him, but he had a great time where he was. We stayed in a cabin in the woods where it was nice and cozy. After our days of exploring we came back here to make caramel apples, drink hot chocolate, explore outside, sit in the hot tub and watch movies. It was a wonderful and much needed break from our rat race.